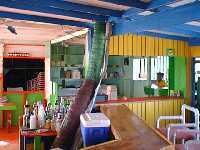 "The next day, having had enough of haute, we elect local cuisine and turn off Anguilla's main road at a sign that promises 'Happiness awaits at Palm Grove Bar and Grill'. 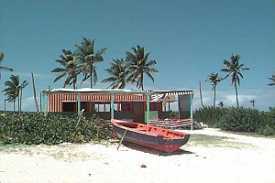 Dodging the goats, we head down a one-and-a-half mile dirt road leading to a grove of palms abutting Junks Hole Beach." "Happiness awaits within a green, orange and yellow shack at the water's edge. We are greeted by the owner, Nat Richardson, who assures us that he has 'the best lobster on the island.' 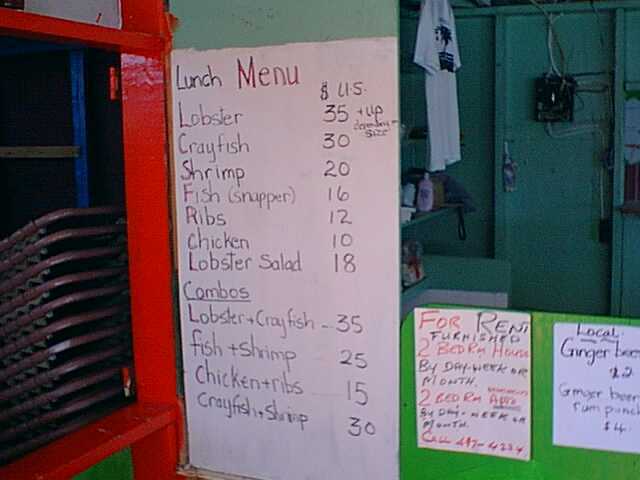 Best because 'the fishermen know to bring me lobsters right after they are caught'...."
Update: The original Palm Grove building was washed away by the flood waters of Hurricane Lenny, but it has been rebuilt! Read all about it. 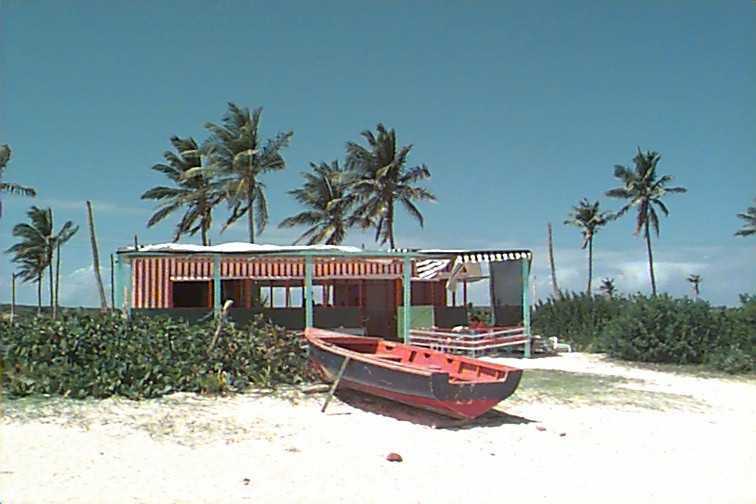 The beach at Palm Grove is a long deserted curving stretch of sand. The snorkelling is very interesting out in the bay past the rock. We saw eels and squid and a manta ray, as well as the colorful tropical fishes that you expect everywhere on Anguilla. Served with home fries and "Johnny Cakes". Open for lunch, and for dinner if you call 264-497-2738 to make a reservation. They are also starting breakfast service upon request. 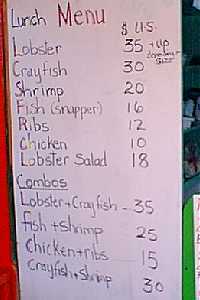 We had great low-key lunches Junks Hole Bar on our last visit, and the people are typically "Anguillian friendly." One day we accidentally ran out of cash there and had to cancel our orders. 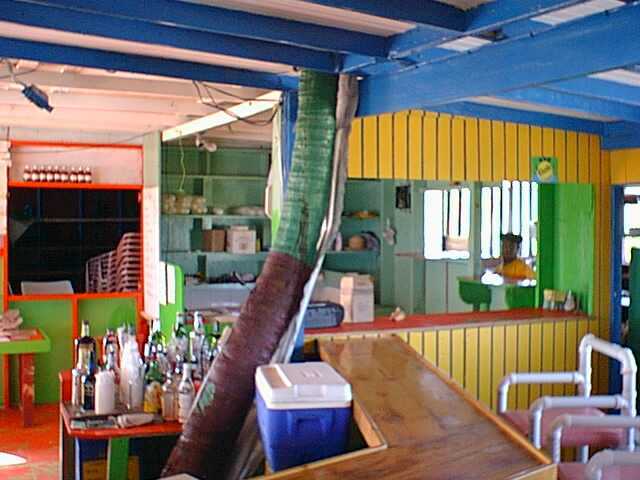 The owner wouldn't hear of us not eating and drinking - he served us terrific fish, cold beers and Tings and said, "No problem, come back later and pay me." I can't imagine this happening anywhere in the Caribbean except Anguilla.